Controversies in Care By Inga Hansen ADM in Aesthetic Augmentation Positive anecdotal evidence is fueling the expansion of indications for ADM in aesthetic surgery. Acellular dermal matrix (ADM) has become a valuable tool in implantbased breast reconstruction, based on its ability to help repair and expand thinned and damaged tissue. The widespread acceptance of ADM in reconstruction has led to its use RICHARD A. BAXTER, MD in cosmetic breast augmentations. In these cases, it is primarily used to correct capsular contractures and implant displacement in revision surgeries. 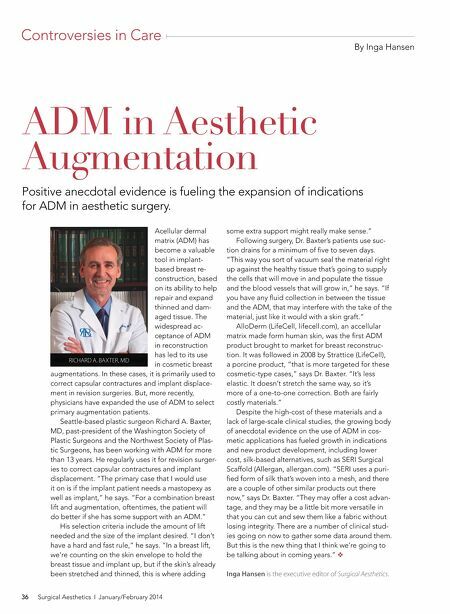 But, more recently, physicians have expanded the use of ADM to select primary augmentation patients. Seattle-based plastic surgeon Richard A. Baxter, MD, past-president of the Washington Society of Plastic Surgeons and the Northwest Society of Plastic Surgeons, has been working with ADM for more than 13 years. He regularly uses it for revision surgeries to correct capsular contractures and implant displacement. "The primary case that I would use it on is if the implant patient needs a mastopexy as well as implant," he says. "For a combination breast lift and augmentation, oftentimes, the patient will do better if she has some support with an ADM." His selection criteria include the amount of lift needed and the size of the implant desired. "I don't have a hard and fast rule," he says. "In a breast lift, we're counting on the skin envelope to hold the breast tissue and implant up, but if the skin's already been stretched and thinned, this is where adding 36 Surgical Aesthetics ❘ January/February 2014 some extra support might really make sense." Following surgery, Dr. Baxter's patients use suction drains for a minimum of ﬁve to seven days. "This way you sort of vacuum seal the material right up against the healthy tissue that's going to supply the cells that will move in and populate the tissue and the blood vessels that will grow in," he says. "If you have any ﬂuid collection in between the tissue and the ADM, that may interfere with the take of the material, just like it would with a skin graft." AlloDerm (LifeCell, lifecell.com), an accellular matrix made form human skin, was the ﬁrst ADM product brought to market for breast reconstruction. It was followed in 2008 by Strattice (LifeCell), a porcine product, "that is more targeted for these cosmetic-type cases," says Dr. Baxter. "It's less elastic. It doesn't stretch the same way, so it's more of a one-to-one correction. Both are fairly costly materials." 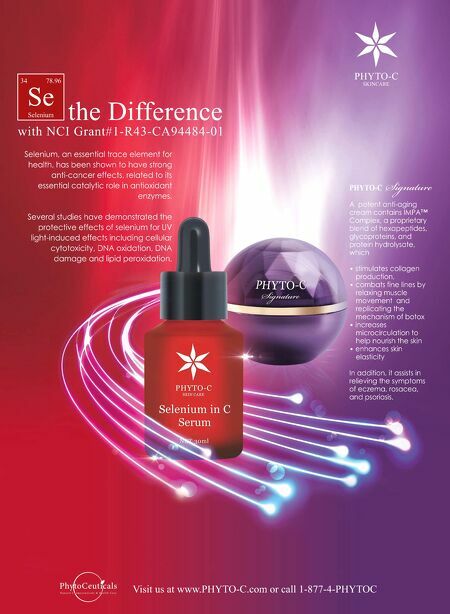 Despite the high-cost of these materials and a lack of large-scale clinical studies, the growing body of anecdotal evidence on the use of ADM in cosmetic applications has fueled growth in indications and new product development, including lower cost, silk-based alternatives, such as SERI Surgical Scaffold (Allergan, allergan.com). "SERI uses a puriﬁed form of silk that's woven into a mesh, and there are a couple of other similar products out there now," says Dr. Baxter. "They may offer a cost advantage, and they may be a little bit more versatile in that you can cut and sew them like a fabric without losing integrity. There are a number of clinical studies going on now to gather some data around them. But this is the new thing that I think we're going to be talking about in coming years." ❖ Inga Hansen is the executive editor of Surgical Aesthetics.